If you are taking my advice and spending some of the summer out on the water trying a little stand up paddle board action, then you already know what great fun this is. Of course, if you are still renting your gear from a local SUP gear shop, then you are kind of flushing money down the drain. Don’t get me wrong – I am all for renting gear when you are new to a sport or activity, since you don’t know if you’ll actually enjoy it. I even understand the convenience of renting gear as opposed to hauling it yourself. 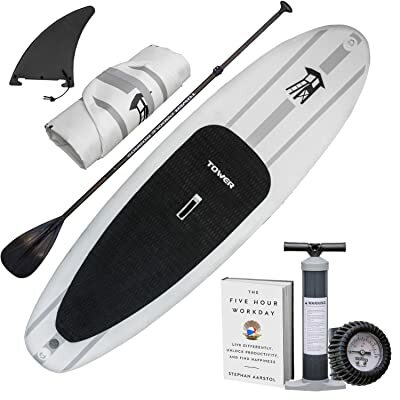 But here’s the thing – with inflatable stand up paddleboards, you get something that is easy to transport and that has a relatively low cost compared to renting each and every time that you want to get out on the water and do some SUPing. With that in mind, I highly suggest that you consider buying a cheap inflatable SUP for yourself. You can actually find a few different models that offer a great value for the money. And I want to tell you about my very favorite inflatable stand up paddle board as it is a great one to take out on the water. If you want the most bang for your buck when shopping for a new iSUP, then you can’t do any better than the Tower Adventurer 9’10” Inflatable SUP. As you can tell from the photo, this inflatable standup paddleboard from Tower is sturdy enough to carry more than one person out on the water. You can even take your dog out with you, if you want. It handles very well in the water and leaves you feel really confident when you are paddling on it. That makes it a great choice for beginners as well as seasoned SUPers. Another nice thing is that it handles well in waves. So, you don’t just have to stick to recreational paddling in relatively calm waters. You can also take it to the beach and ride those waves. What really makes this a great value to me is that you get a lot for your money. You see, when you buy this, it is not just the inflatable board. Nope. You also get a paddle and a pump. That’s pretty much everything that you need for a day of fun in the water. Pretty much the only thing lacking is a carry pack, but you can easily buy one of those cheap or just not worry with one at all. Up to you really. In fact, if you have one of those really big blue IKEA bags, then you can just use it to carry your rolled up board in. That’s what I do actually. It fits in it just fine and it saves me the cost of having to buy a special pack just for the board. Click here for our full review.